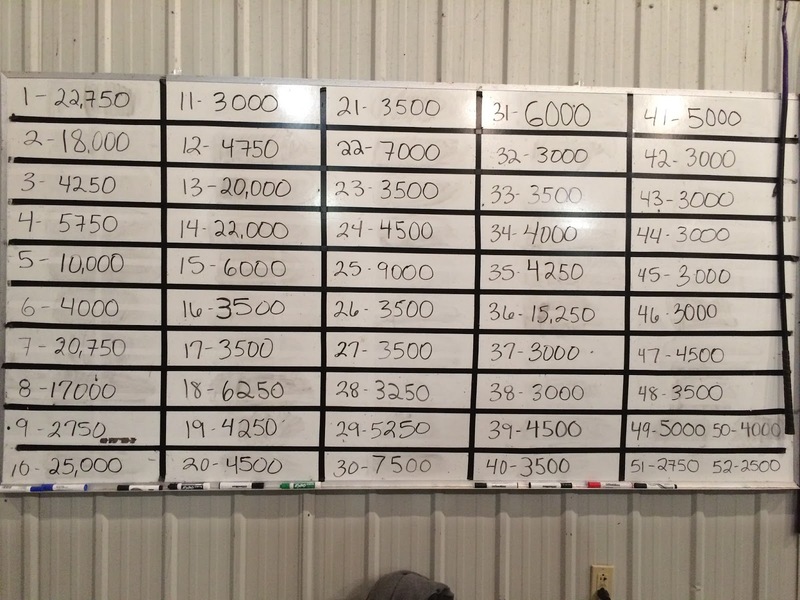 An updated picture of the bid board at 6:00 pm Sunday, September 13, 2015. We will work the next few days on bidding them off. If you have questions on where we are or what lots are up call Kyle Lemmon, Nate, Emily, Jeff, or Kyle Pegg. 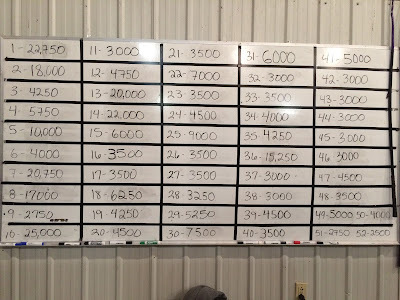 We will start from the highest bid on the bid board and work our way down. Thanks so much for the interest and support. Hopefully we'll be talking to you soon. Picture of the bid board as of 5:40 pm Sunday, September 13, 2015. We will continue to update the board throughout the day. If you have any questions please contact Time, Kyle, or Nate. 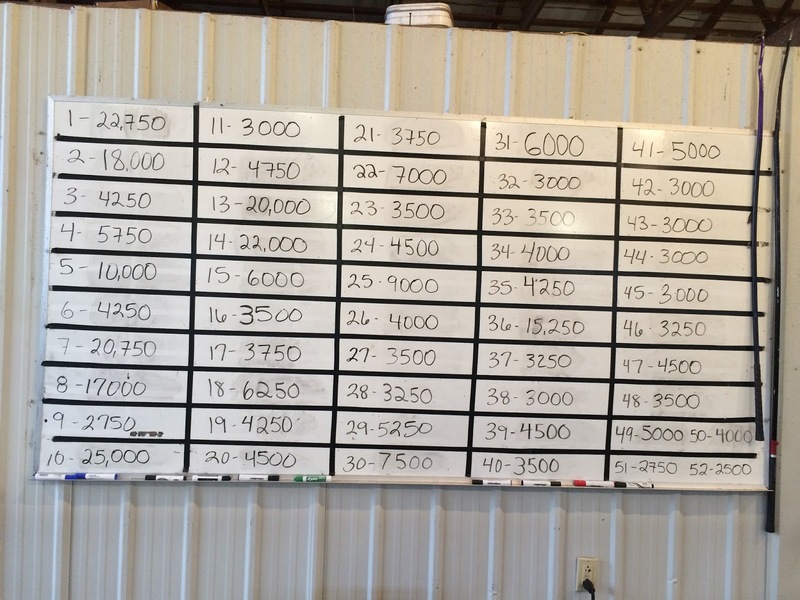 Bids will close tonight at 6:00 pm. 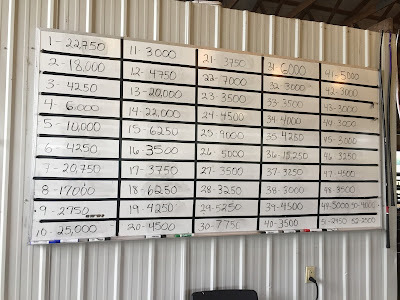 At that point we will start first round call backs on most cattle and work on bidding off starting with the highest bid on the board. If you have questions about the bidding process we would be happy to answer those for you. Picture of the bid board as of 4:30 pm Sunday, September 13, 2015. Picture of the bid board as of 2:40 pm Sunday, September 13, 2015. Picture of the bid board as of 10:30 am Sunday, September 13, 2015. Picture of the bid board as of 8:00 pm Saturday, September 12, 2015. We will continue to update the board throughout the days leading up to Sunday. If you haven't yet made plans to stop by we encourage you to do so. 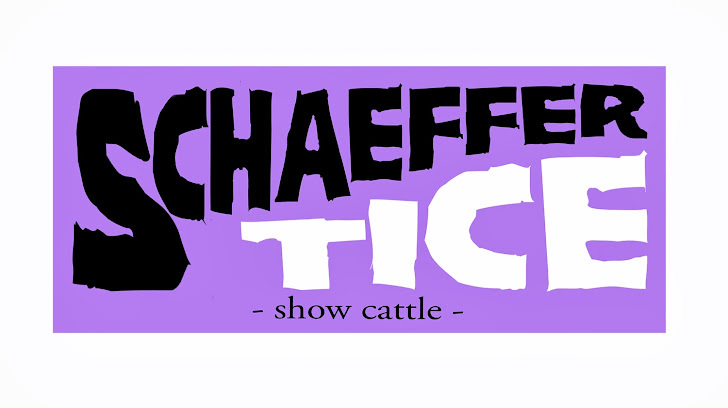 If you have cattle you would like to discuss with Tim, Nate, or Kyle the earlier the better. As we get closer to the weekend the phones get pretty busy. Don't hesitate to contact us! 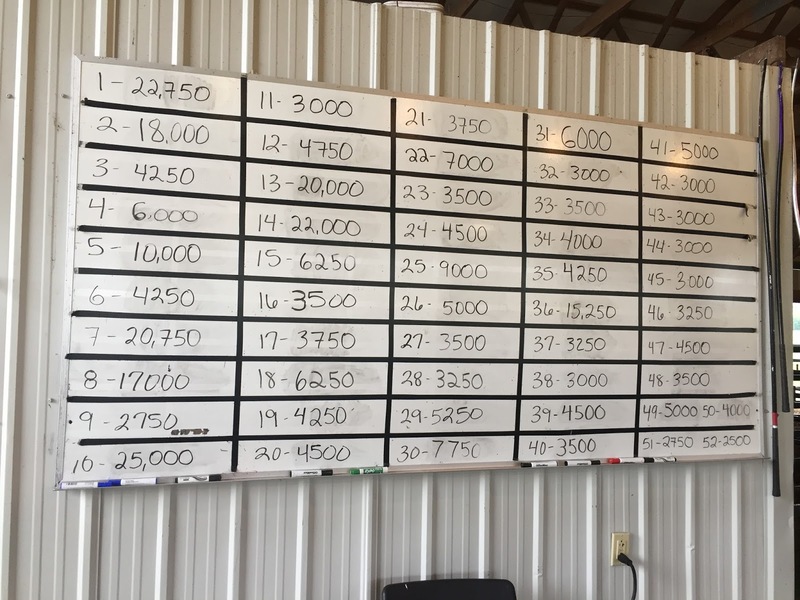 Bids will close Sunday, September 13th at 6:00 pm. 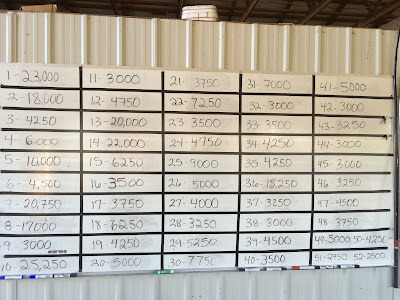 At that point we will start first round call backs on most cattle and work on bidding off starting with the highest bid on the board. If you have questions about the bidding process we would be happy to answer those for you. 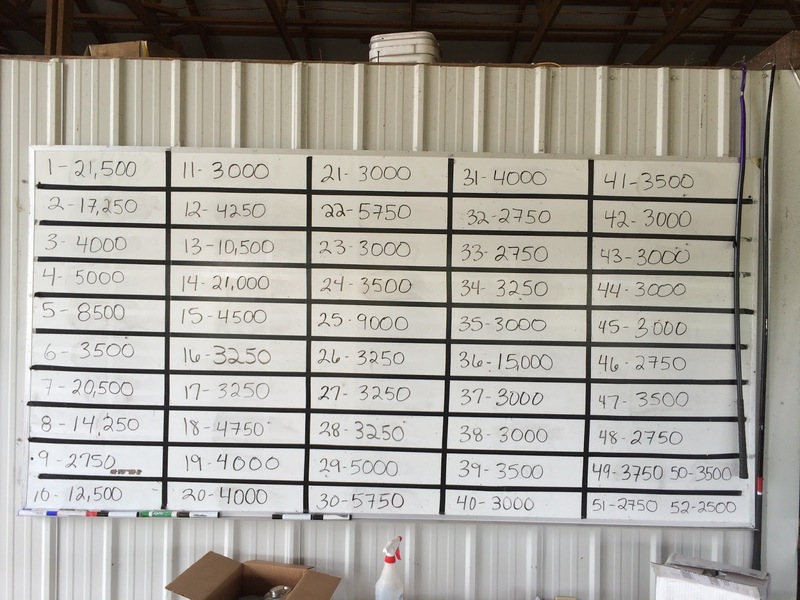 Picture of the bid board as of 3:30 pm Saturday, September 12, 2015. 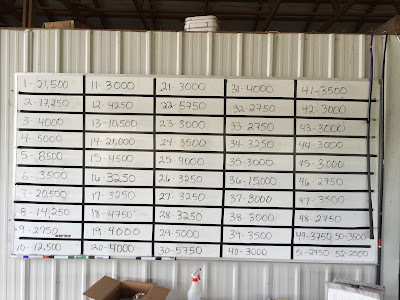 Picture of the bid board as of 10:00 am Saturday, September 12, 2015. Picture of the bid board as of 9:00 pm Friday, September 11, 2015. 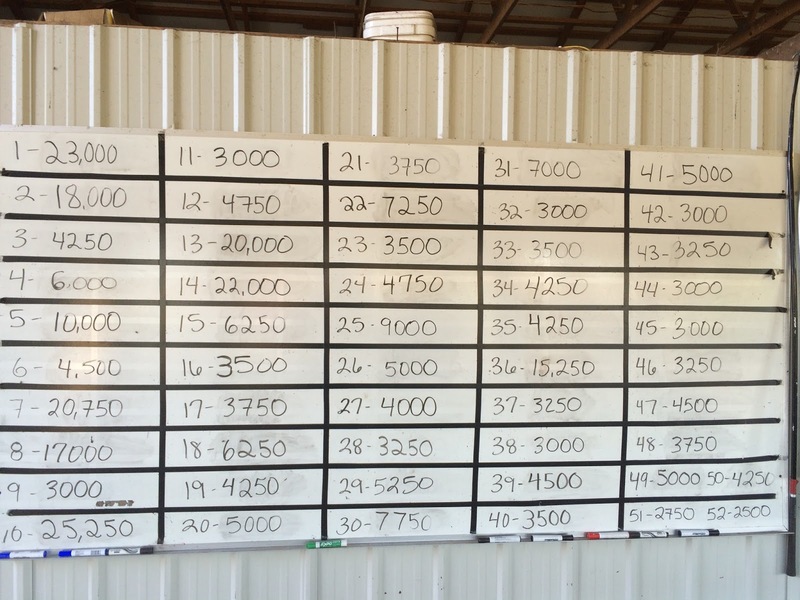 Picture of the bid board as of 1:30 pm Friday, September 11, 2015. 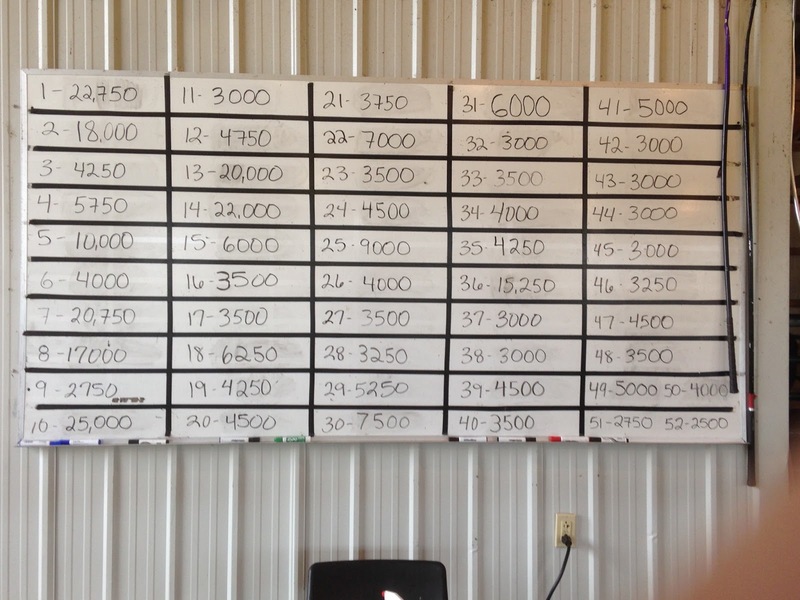 Picture of the bid board as of 8:00 am Friday, September 11, 2015. Picture of the bid board as of 1:30 pm Wednesday, September 9, 2015. Picture of the bid board as of 10:30 am, Monday, September 8, 2015. Picture of the bid board as of 6:30 pm, Sunday, September 6, 2015. We will continue to update once daily until we get closer to bid's closing and then we will update throughout the day. Make your plans to visit the farm and check out a great set. If you have any questions don't hesitate to contact us. We hope to see you before September 13th. Picture of the bid board as of 9:30 am, Sunday, September 6, 2015. 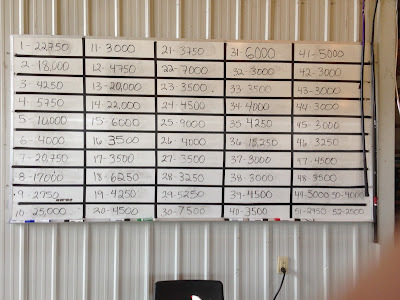 Picture of the bid board as of 2:30 pm Thursday, September 3, 2015. It's a great weekend to stop by and see us! 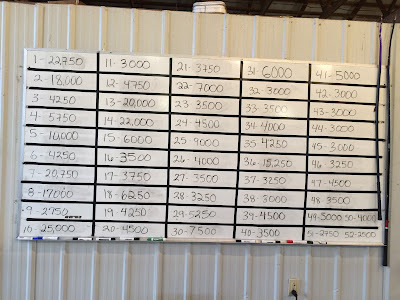 Picture of the bid board as of noon Saturday, September 5, 2015. Picture of the bid board as of 11:00 pm Thursday, September 3, 2015. Picture of the bid board as of 8:00 pm Wednesday, September 2, 2015.